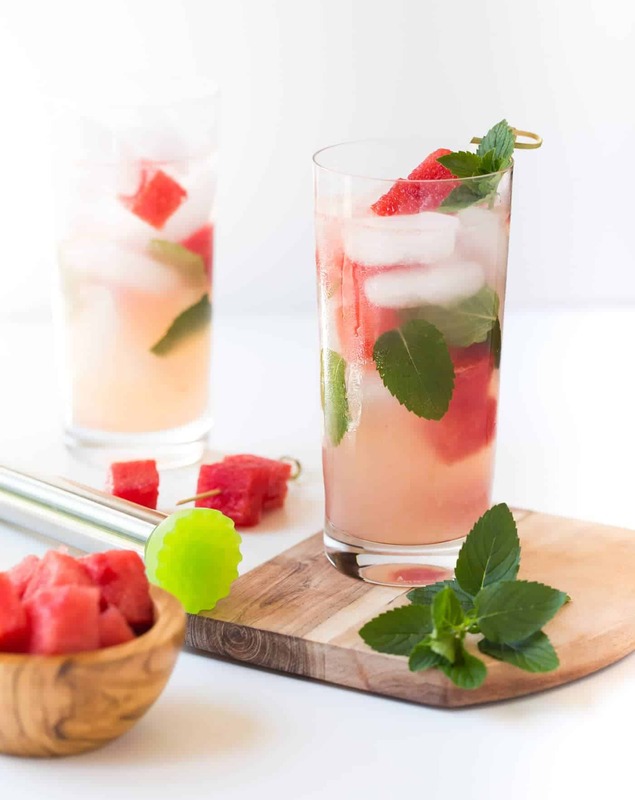 Beat the heat with this refreshing Watermelon Mojito recipe! Watermelon Mojito. Need I say more? C’mon, I know it’s already August, but summer isn’t over yet! Yes, there are school supplies to be purchased, and deadlines and late fees for fall activities are bearing down on us at every turn. But let’s savor these last few weeks of visits to the pool, s’mores, bonfires and lazy nights in the backyard before the crazy school schedules start again. And what better way to appreciate these dwindling days of summer than with a refreshing Watermelon Mojito in hand? Many mojito recipes use simple syrup (which is a fine substitute) but I prefer superfine sugar in my version. 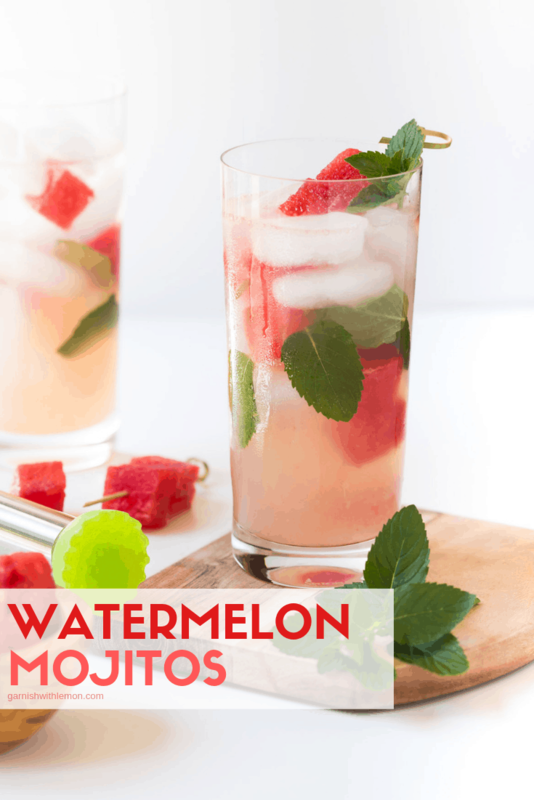 A quick stir with fresh lime juice dissolves it nicely, and then I muddle a bit of mint and watermelon together before adding the rum and club soda. Don’t forget to float a few extra watermelon cubes in the glasses before serving. They are super tasty to snack on when the mojito is done. Like it or not, school will be here before we know it, but this weekend you’ll find me on the patio enjoying a Watermelon Mojito and watching the sun go down with my kids. Who’s with me? Tip: Have leftover watermelon? Don’t miss our sweet and salty Watermelon Feta Salad! It’s one of our summer side dish staples. Quench your thirst on a hot summer day with this uber-refreshing Watermelon Mojito recipe! Place sugar and lime juice in a collins glass. Stir until sugar is dissolved. 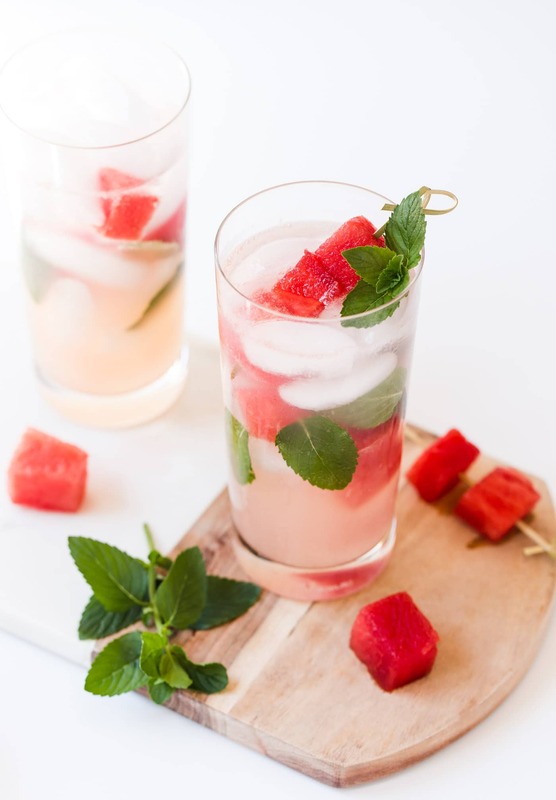 Add 2 watermelon chunks and 5 mint leaves to the glass and muddle. Fill glass with ice, pour in rum and top with club soda. Garnish with remaining watermelon and mint leaves.